This is my wife Lynne Nelson. 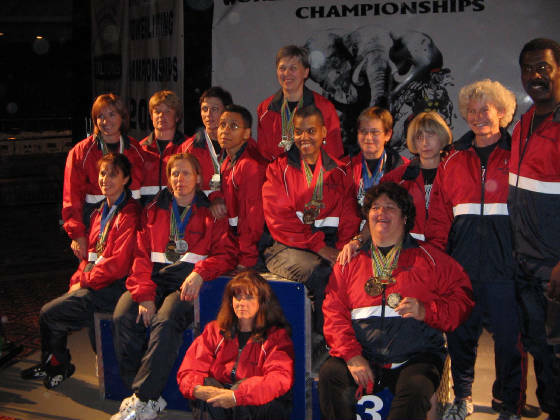 Her she is (third from the top left) as a member of Team USA at the 2005 IPF Master's World Championships held in Pretoria South Africa. She competes in the 165 Open and Master classes. So far she has a best meet total of 1026lbs, which was accomplished at the 2005 USAPL Woman's nationals in St. Louis. AT that meet she placed first in both the Open and Master 165lb divisions. So welcome to her powerlifting website. Take your time and see what is here. Visit all the pages, read the articles, and look at the training and meet pictures. I hope you enjoy her site, and can offer advice on how I can make it a better place to visit. Lynne is 46yo, married, and the mother of two children. She lives in the Northwest section of Virginia, and works as a Medical Technologist. She competes in the AAU, USAPL, WNPF, APA and the USPF. She competes in the Woman's 165lb Open and Master 1 Classes. She has now started training for the 2006 USAPL Woman's Nationals in Denver. If she wins her class, she will earn a spot on the USA team that will compete at the IPF Master's Worlds to be held in Kileen Texas. Lynne's best lift is the deadlift. Throughout her lifting, it has been the single lift that has won meet for her. To date her best deadlift was 479lbs at the 2002 USAPL NE Regionals. 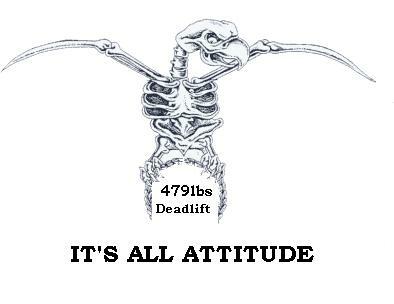 It was listed in Monster Muscle Magazine as the 15th best ever overall deadlift. As she weighed only 144lbs it was over 3xbwt lift. Usually a sumo style lifter, Lynne has decided to switch to the conventional style, due to her long leg/long arm body type.